Why All Aboard America! Charters? ALL ABOARD AMERICA! has a distinguished history that dates back to 1936 when Henry Page formed the Potash Mines Transportation Company to transport potash miners to and from their jobsites in Southeast New Mexico. Trailers pulled by trucks were the original buses of the company. As the trailers traveled through the southwest, smoke stacks through the roofs of the trailers sent out puffs of smoke from pot belly stoves that kept the miners warm as they traveled. Henry’s daughter Coradene and her husband Jack L. Wigley later formed Industrial Bus Lines, Inc. to expand the original business into West Texas and Arizona, merging the two companies in 1971. As Industrial Bus Lines continued to expand, it needed a new name to better identify the company and its wide array of services. In 1989, ALL ABOARD AMERICA! became the new company name. Today ALL ABOARD AMERICA! is led by Jack L. and Coradene’s son Jack D. Wigley as President and CEO. Jack D’s vision and leadership has taken ALL ABOARD AMERICA! 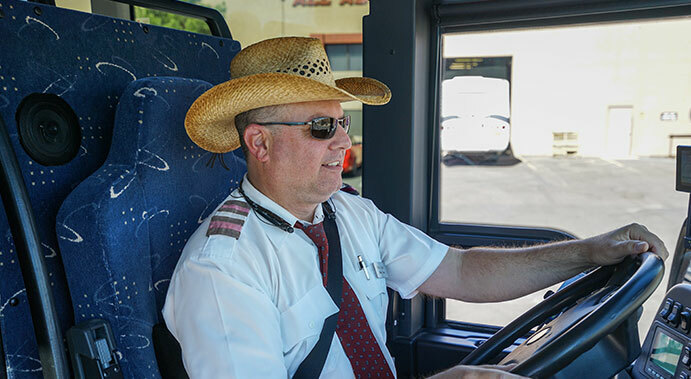 to new heights and has transformed the company into a major player in the motorcoach industry. ALL ABOARD AMERICA! is proud of its strong Southwest USA history and its family-oriented workplace. We pride ourselves in taking care of our dedicated team of employees as well as our valued customers who expect the very best service possible. 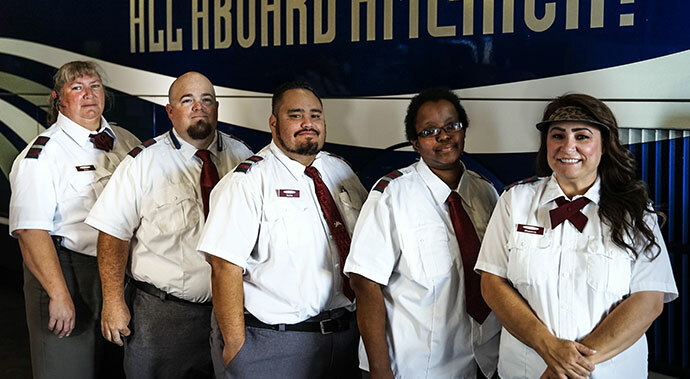 Our mission is a unified effort to provide exceptional safety for everyone who steps aboard an ALL ABOARD AMERICA! motorcoach. All Aboard America! maintains the highest DOT safety ratings. We’re proud of all the hard work our team puts into prioritizing safety at all times. We even have our own in-house shop that ensures our fleet stays operating safely. Having tenured employees who love their jobs helps us serve you better. Looking to join our team? View our careers page now. Your travel needs aren’t limited to a 9-5 schedule, so neither are we. 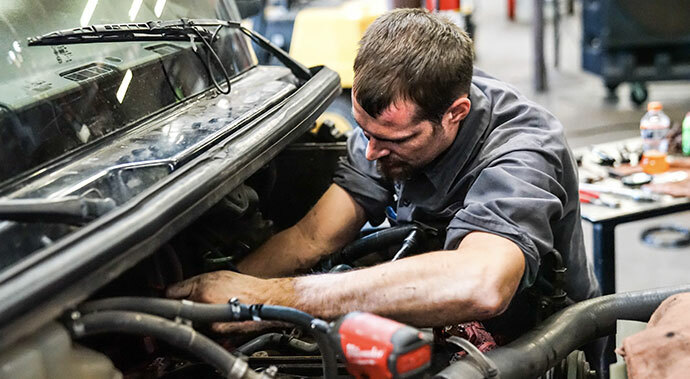 Our team of highly trained dispatchers and mechanics are on-call 24/7. No matter the time of day or night, they’re ready to provide expert service. 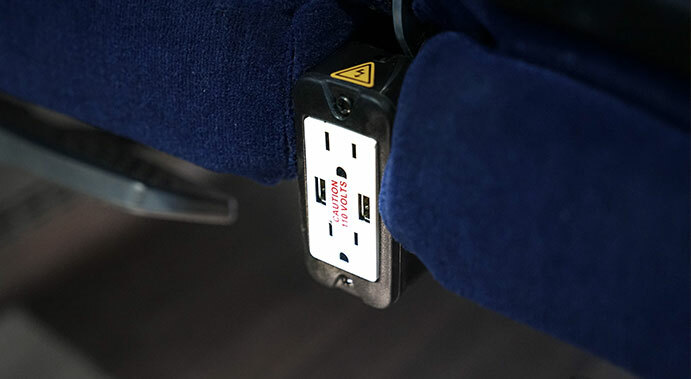 With amenities like WiFi, power outlets, reclining seats, and on-board restrooms, our modern motorcoaches are comfortable and convenient. All Aboard America! is the recipient of the UMA Green Highway Award, the UMA Vision Award, the IMG Operator of the Year Award, and the UMA Motorcoach Industry Achievement Award. These awards demonstrate our commitment to protecting the environment and providing excellent service to our customers. We provide customized charter bus rentals for groups of every type and size. 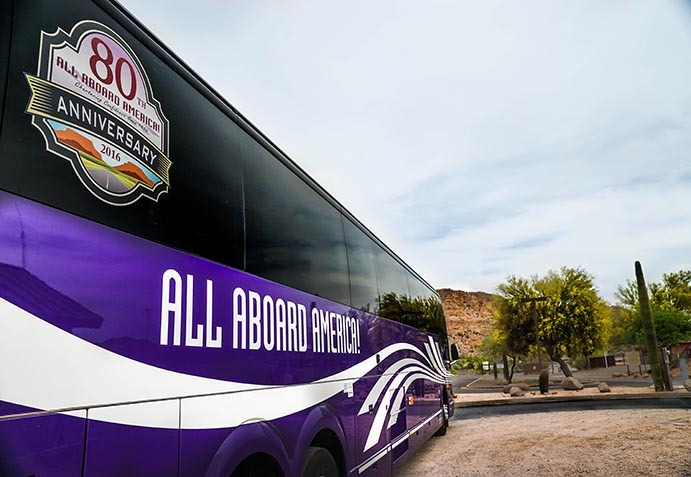 From concerts and field trips, to corporate events and weddings, you can count on All Aboard America! for your group transportation needs. All Aboard America! provides day trip service to local casinos like Harrahs’ AkChin and Inn of the Mountain Gods. We also provide custom overnight trips to Nevada casinos.